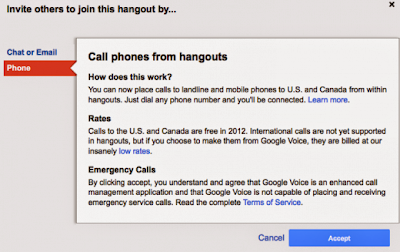 It wasn’t very long ago that we saw Google was changing its Hangouts function inside of Google+ in a big way. The addition of Extras turned Google+ into a virtual meeting room, classroom and collaboration center. 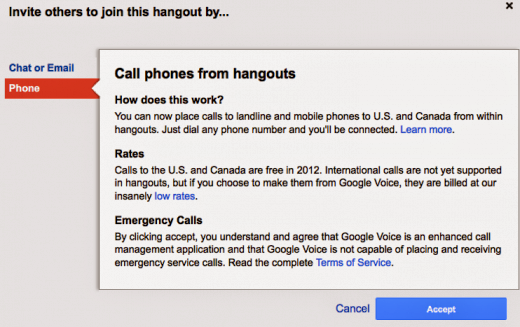 Today that gets even more useful as Google+ Hangouts will now let you make free phone calls, bringing anyone in the US and Canada into your group, no computer required. According to a post on Google+ by Jarkko Oikarinen, it’s available now by heading to the Hangouts with Extras page. Once your hangout is ready to go, just click Invite, click the Phone tab and put in the number that you wish to call. While the platform was already powerful, TechCrunch rightly notes that the addition of this feature will open the door to even more uses for Google+. As we originally noted on the release of Extras, this platform could easily be used for collaborative meetings, and now it’s even more likely since you won’t have to have all of your participants in front of a computer in order for it to happen. There’s no word yet on when, or if, the free calls feature will go outside of the US and Canada. Since this is likely using the exact same system as Google Voice, you can expect parallel updates to both it and the Hangouts calling feature.